Philosopher Immanuel Kant was so startled by reading David Hume's "An Inquiry Concerning the Human Understanding," that 'it awakened him from his dogmatic slumber,' so he wrote. 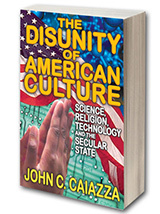 Transaction Publisher's new release, The Disunity of American Culture, with subtitle, Science, Religion, Technology and the Secular State by John C. Caiazza will hopefully shake and awaken America from its dogmatic slumber before she completes her spiral down into a total atheist socialist state. At last, a definitive answer to the burning question we all have wrestled with; How did America get to this point in history? What steps were taken to lead us down that path? An unnecessary clash of religion and science was a start along with a rise in militant atheism and secularism which, "rolled over the U.S. like a tsunami, overtaking all walls and breaches erected to contain its force, even as it washes over ideals of transcendence and public examples of religious faith that have actuated American life from its beginning." Thus "the mere mention of God in public, much less the expression of the Ten Commandments carved in stone outside of a courthouse, is deemed too explicit an imposition of religious belief on the public order This constitutes, it may be said, a fight for the soul of the West," writes the author. A very interesting tidbit on page 127; " Karl Marx was fascinated with evolution to the point of requesting Darwin's permission to dedicate his book, Das Kapital, to him." As churches began conforming to the world, and the Gospel message became diluted, the strength of the church ebbed. Such social mandates as "tolerance" which curtails religious liberty, replaced biblical truth. The gradual loss of spiritual power has affected the entire nation as it has affected Europe, sapping its strength. "In Western Europe," the author details, " there has been what its critics describe as a hollowing out of its culture, namely the Christian religious sensibility that basically formed European culture." Professor Marcelo Pera," a humanist philosopher, was particularly concerned that the decline of the influence of Europe's Christian heritage was leaving Europe vulnerable to threats from Islamic expansion." And that is precisely what has happened. As America lost its soul and weakened spiritually, September 11,2001 was able to rise and explode. Since this was done in the name of religion (Islam), this gave the enemies of God ammunition to make their case against religion in general as violent and destructive to life, which included Christianity. Strangely, society is more concerned about 'the threat of Christianity' than Islam. This pushed Christianity, the very strength of America, to the sidelines and out of sight. The Disunity of American Culture is the most difficult book I have ever tried to review. Every chapter of this work is packed with so much fascinating information that each would warrant a complete review of its' own. Caiazza's book offers the most complete history of religion, science, technology, education, atheism, stem-cell research, sexuality, movers and shakers of history, and philosophy ever compiled so effectively in one (277 page) volume. Philosophy buffs will find a feast of material including the philosophers studied in college along with some important ones lesser known. For those who have not been to college and wish you had, this book will fill that void. It is a profitable read that will give you the benefit of a college education. So how did we get to this point? Richard John Newhaus the Catholic writer was quoted from his book, Naked Pubic Square; "First has been the broad acceptance of the collapse of public moral standards, exemplified in the vulgarity of popular entertainment, high divorce and illegitimacy rates, cohabitation among couples, and the legitimizing of alternative lifestyles (i.e.gay marriage)." "As each of these developments has been the subject of litigation and legislation, they have become protected by law, and thus," Caiazzia's book states, "it appears that Neuhaus's worry about the dominance of law over culture (and religion) has been plainly justified." Any flaws in this book? Sure. On page 54, Jerry Falwell was pastor of Thomas Road Baptist Church in Lynchburg, Virginia- not Kentucky. On page 232, the author states how a magician floats a woman in the air ("she is suspended on thin wires hidden by the darkened stage.") Not so. Another device is used. This reviewer was once a magician and performed the 'floating woman' at a county fair, outside, on a platform under the stars. Then there was a disturbing line on page 71 (we read every line of a book for review), "for it matters a great deal if human nature is solely explainable by its biological basis and thus not particularly different from the animal life forms to which the human body is obviously related." In this, the author sounds Darwinian. Whatever that meaning, Caiazza's book is in no way one-sided. He gives expert scholarly analysis of every issue involved in bringing us to The Disunity of America. So what is the solution? Can things be turned back around? The teacher in me mandates that readers go through the last four chapters, then analyze, synthesize, evaluate, then work out a proper conclusion. Rev. Miles has been a college instructor, licensed by The California State Board of Education..